PRODUCT: 40 MM WIDE x 2 MM SLOT, ANGLED, HOT-AIR WELDING NOZZLE (type 107.132). PRICE/EACH. * 1-1/4" ID ADJUSTABLE CLAMP ON. * FITS ALL POPULAR HAND HELD HOT AIR ROOFING WELDERS INCLUDING: BAK RION, SIEVERT TH1650, STEINEL, FORSTHOFF, MOST OTHERS. 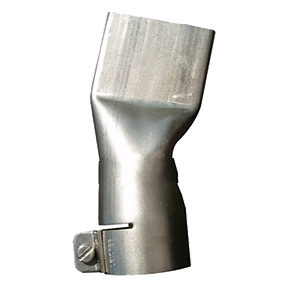 * MOST POPULAR SELLING ROOF MEMBRANE WELDING NOZZLE. * TPO AND PVC ROOFING MEMBRANES. * PRECISION CONSTRUCTED WITH 304 STAINLESS STEEL.